* The cost to the taxpayers: While the system is operated by a private company (Clear Channel Outdoor) the financing comes from the public coffers to the tune of 75 million pesos. For Mexico this is not a meager sum. Clear Channel also received authorization for 150 billboards across the city. According to this note, there is an assumption of 3 million pesos lost to theft and vandalism per year. If the actual losses exceed this projection the government of the Federal District will pay the difference (Apparently CC is not taking any financial risk). After 6 weeks approximately 2,400 people have signed up for the service, ~1,600 per month. The Federal District's government's target is 24,000 users. A back of the envelope calculation makes me think that they are aiming to recover their investment in 10 years. They may or may not reach their goal, I hope they do. The system may or may not be working in 10 years, but I can not remember a single program in Mexico that lasted that long. Once the politicians have taken their cut there is little incentive to maintain it in working order. * Misguided priorities: This is the same government that is not capable of keeping the street lights working or the trash off the streets. When I'm with my daughter in the "Parque Mexico" and she needs to use the bathroom we have to pay (exact change only!) and a drinking fountain is nowhere to be found in the whole city. * The cost for the user: The minimum salary in mexico is 57.5 pesos per day. A quick search reveals that in New York it is U$7.25 per hour. If you compare a la UBS Big Mac Index the 5 days of minimum wage it takes to pay the ecobici fee would be equivalent to 290 US Dollars. This obviously is not an exact equivalency but it gives you an idea of what 300 pesos means to a person earning minimum wage. * The need for a credit or debit card: not everybody has them obviously. I suspect that among people riding the metro and wanting to use the bikes for the "last kilometer" (the alleged target audience) the proportion of cardholders is lower. This requirement also means that the system is of no use to tourist. * Since I am not a bike rider I can not comment on how safe riding a bike in these areas is, but I have read many comment indicating that it is border line suicidal (on the launch day a D.F. government official had an accident trying to avoid a car!). There are no bike lanes so some riders take to the sidewalks. As a pedestrian I can tell you this is annoying and potentially dangerous. This has been characterized by the government as "details" that will be worked out eventually. 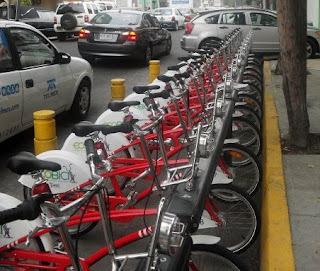 Martha Delgado, environment secretary stated, on the record, that "usage comes first, then the infrastructure" I disagree, they should have taken care of this before unleashing these 1,000 bikes on us. I realize that this sound pessimistic and cynical. I am completely in favor of changing the way we live to be more eco-friendly, but the concepts should be sustainability and cost/benefit. If money is not an issue, why not give away priuses to everybody?, or subsidize them at least for use as taxis. Instead they have chosen to drop this program in these gentrified neighborhoods where they are needed the least. 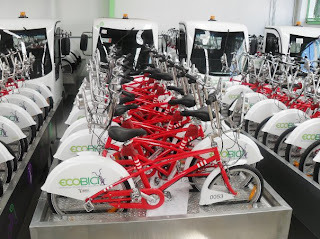 Ecobici I used to, however I think it takes planning and a good draft.